The atemoya tree pictured on the right is a variety called Gefner, and was photographed in October. It was planted about a year and a half earlier in late March 2008. I mail ordered it from Florida. It is planted on the northeast side of a large pine tree, about 6 feet from the pine trees drip line, so it gets shade during the hottest part of the day. It still gets a reasonable amount of direct sun the rest of the day. This atemoya tree grows continously during warm weather and sheds its leaves for a brief period in early spring. It is the second atemoya I have attempted. The first one I tried was a variety called 48-26, a red fruited variety. It was a slow grower and died in late winter. I believe that I probably watered it too much over the winter, because I have read that atemoyas get root rot easily in cold weather when their roots are kept too wet. Therefore, I turn off the water to my current Gefner atemoya during the winter, and only water it occasionally by hand, maybe once a month, during the cold part of the year. It appears to be working, because the Gefner made it through last winter without any problems. This atemoya tree produces flowers starting in late spring, all through summer, and into the fall. It has not fruited yet, but I have noticed that the flowers are getting larger in size as the tree gets more established. Gefner atemoyas are supposed to be able to set fruit without hand pollination. Most trees do not produce fruit in their first two years so it is too early to tell if hand pollination is necessary. Atemoya trees are a cross between a sugar apple tree and a cherimoya tree. Sugar apple trees are more adapted to hot tropical lowlands while cherimoya trees are more adapted to a cool mountain climates and are more frost tolerant. Combining these two trees results in a plant that has greater frost tolerance than a sugar apple but more heat tolerance than a cherimoya, making it a good candidate for Phoenix Arizona. 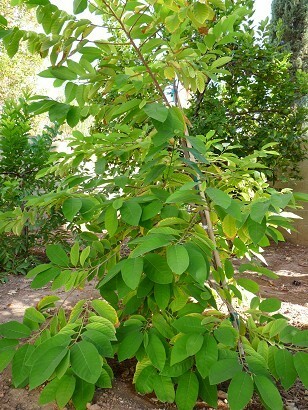 Atemoyas grow well with small amounts of mild organic fertilizers such as fish emulsion. Our heavy clay soil prevents adequate aeration of the root system, so atemoyas do better when large grained sand is mixed in during planting. Atemoya trees do better with some afternoon shade in the summer. Other than that they take the heat well, as long as they are adequately watered. Being hardy to 29 F. atemoya trees should be covered when temperatures are predicted to be below freezing. They should be watered much less during the winter because they are susceptible to root rot during cold weather. Dig a hole at least twice the size of the rootball. At a minimum, make the hole 2 feet in diameter and 2 feet deep. Back fill the whole with the same native soil that was removed, and add several pounds of sand. Be sure to mix the backfill as thoroughly as possible. Atemoyas seem to become chlorotic easily, so adding sand to the soil will improve air penetration into the soil and help the roots to stay more healthy. It also is a good idea to finish with the hole an inch or two recessed so that a watering basin is formed. After planting, spread a thin layer of compost on top of the soil to help conserve moisture and to supply some nutrients. Do not fertilize the newly planted tree until it has been vigorously growing for a couple of months. Atemoyas do well on a grass watering schedule during the warm and hot months. During the cold months, cut back on watering considerably. I turn off the water to my atemoya during winter and hand water it every 3 to 4 weeks. Atemoyas seem to be able to grow well even on poor soil, so little fertilizer is needed. However, very small amounts can help speed up growth, but one must be careful because atemoyas are somewhat salt sensitive. Since the Phoenix area water is already high in salts, the safest thing to do is to not use any chemical nitrogen fertilizers. During the warm and hot months, infrequent applications of 5-1-1 fish emulsion are beneficial. Avoid fertilizing the tree when it is coming out of dormancy, which can take a long time in the spring. Wait until the tree is covered with large healthy leaves. Select varieties of Atemoya are grafted. Since an atemoya is a very specific combination of two different trees, an atemoya seedlings is very unlikely to be an atemoya.